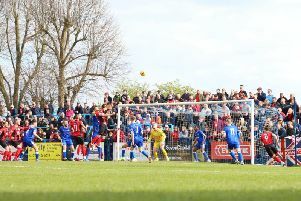 Marcus Law expects the remainder of the Evo-Stik League South Premier Division Central season to be “a roller coaster” after the title race swung back in Kettering Town’s favour. The Poppies suffered a setback last Tuesday after they were beaten 3-2 at home by Biggleswade Town. But that disappointment was wiped out yesterday (Saturday) as the Poppies’ 1-0 success over Royston Town at Latimer Park was coupled by a shock 2-1 defeat for leaders Stourbridge at struggling Hitchin Town. Kettering now sit just one point behind Stourbridge with two games in hand and they will take over at the top if they can beat Coalville Town at home on Tuesday night before the top two collide in the West Midlands next weekend. The Poppies were worthy winners against Royston with Aaron O’Connor grabbing the winner with 20 minutes to go after he had missed a glorious chance to open the scoring in the first half. And boss Law was left to reflect on another week or ups and downs as a fascinating race for the sole automatic promotion place continues. “It’s going to be a roller coaster,” the Poppies boss said. “There will be lots of things that are going to happen and the trick is to not get too emotional when things don’t go your way or do go your way. “We are only in control of the games we are involved in and there is lots football to be played. “We know how this sport works, it’s not always the best team that wins games and you don’t always get your rewards. Over the course of the season, you believe you will. “So yes, this was our day but each result creates pressure in its own way. “I worked with (former Bristol Rovers and Cheltenham Town manager) John Ward for a long time and I remember he said that when you play a team on a good run, it’s probably a good time to play them because a good run will always come to an end and, vice-versa, a bad run will always come to an end. “Stourbridge were on a fantastic run and have slipped up while Hitchin, who were on a terrible run, were the ones who did it and flipped things around. “That’s football and that’s why you can’t get too emotional with the highs and lows. “We were under pressure and Stourbridge also were in terms of seizing the opportunity presented to them but we have made sure we have got the result that was required with a very similar performance to the one last Tuesday. The big difference was that we didn’t make any mistakes. “There was some quality at times and there was some adventurous play as well. “If you want strikers in this league who miss a chance but you know they will get another one, then I think I have probably got two of the top four. “Dan Holman and Aaron O’Connor are experienced and have played at higher level for long periods of time and they can dismiss their mistakes quite comfortably and they know they will get another chance. And that’s where I get my belief in them. There were a number of impressive displays on a good day for the Poppies, not least from defender Lathaniel Rowe-Turner who was recalled to the starting line-up. He started at left-back but switched to centre-half after Declan Towers was forced off with a kne injury after just 20 minutes. Rowe-Turner and Craig Stanley went on to produce solid displays at the heart of the defence to help preserve a clean sheet. And Law added: “It’s a nine-month season and we are all humans who will have ups and downs over that time. “I had a long, straight-talking conversation with Lathaniel and he has responded really well. “He’s not the first player I will have those conversations with and he won’t be the last.